The Karnataka Govt has joint the race of statue making. The Congress-JDS coalition announced today that it will build a 125 meter tall statue of Mother Cauvery. The Karnataka Minister DK Shivakumar confirmed the proposal and also mentioned that no government money would be used to make the statue. The plan is to make a tall tower of Mother Cauvery having a museum, 360 feet glass view, indoor stadium, a bandstand and replica of historical monuments. The project would be spread across 400 acres and would cost about ₹1200 cr. The Government had invited private investors to build and fund the project. 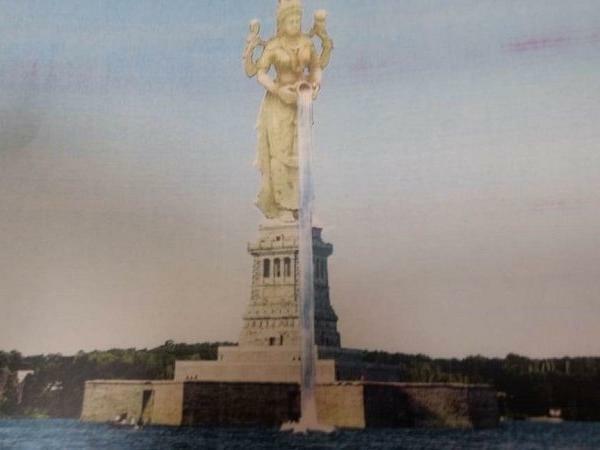 The statue would be built around the KRS dam in Mandya district. This aims to boost tourism around the cauvery region. Looks like the Karnataka Government felt left out after the Modi inaugurated a 182 meter statue of Sardar Vallabhai Patel ‘Statue of Unity’. The Chief Minister during budget session in May this year allocated ₹5 cr to build a Disneyland environment in the basin. This seems as the first move towards the disney amusement park.